No risk for you, shop like a store, but at home! During the payment step, you can choose between "Pay on Delivery" and "Jumia Pay" from the menu on the left to either proceed with pay on delivery or pay with credit card. It's Simple, It's Easy and It's Safe. CoD stands for Cash On Delivery. With CoD, you can pay in cash to the delivery agent upon receipt of your order. Some products, regions or pickup stations may not be available for CoD. Gift cards or vouchers cannot be used to make CoD payments. What should I do when I cannot see a payment option at the check out? If no payment option is shown after you’ve entered your shipping information, it may relate to your Region or some other very specific reasons: please contact our Customer Service Contact Center at 19586 or contact us. It’s simple! When you get to the payment stage while in checkout, simply enter the gift card code in the voucher box. How can I pay for my order on Jumia app or the Jumia mobile website? The Jumia mobile app and mobile website offers all the payment options that the Jumia website version offers. You can pay without any worries with the preferred option of your choice. Are there any hidden charges like sales tax when I make a purchase on Jumia? There are no hidden charges when you make a purchase on Jumia. The order amount is inclusive of all taxes and shipping fees. In case your order is delivered partially you will be required to pay only for the item that has been delivered to you. The order amount will be mentioned on the parcel and the invoice. Please note that we will never ask you to pay extra cash to the delivery. If you experience trouble completing payment through credit card, first thing to do is to make sure that your card is activated for online payments and that you have enough limit to complete the transaction. Your bank can help you verify these details. Some cards issued outside Egypt are also not supported on Jumia and may be declined. Remember that you can complete your order through Cash on Delivery and pay at your doorstep or through other available mode(s) of payment (except for some very specific regions and pickup stations, as well as for products shipped from oversea). Sorry, we only accept one payment method per order. Does Jumia offer payment in installments? Sorry, we don’t offer payment in installments at this moment. 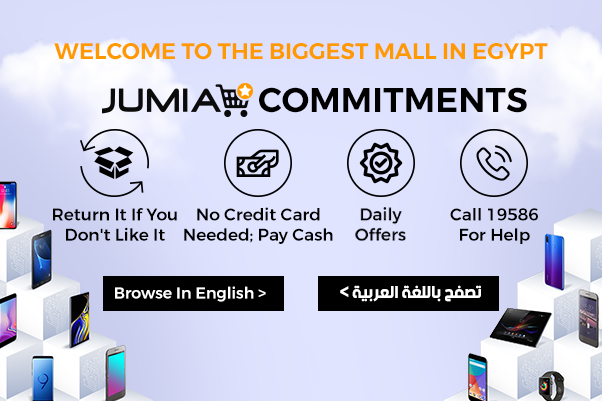 Which currencies does Jumia Egypt accept? My order value is more than the Gift Card amount, what do I do now? If your Gift Card value is less than the order amount, you will be asked to select an additional payment method to complete the payment. Why can't I see the option for Pay On Delivery at checkout? You have in your cart a "shipped by overseas (see the "Jumia Global" logo)" item or a digital product (ex: ticket, coupons). Your delivery option (Location or Pickup Station) is not eligible for Pay On Delivery. Pay on Delivery is currently disabled on your account. Why is the Pay on Delivery disabled on my account? Who do I complain to if I was flagged wrongly? Please contact us on contact us or you can call our customer care at 002 19586 from 10am - 7pm on Saturday to Thursday and we will look into individual cases thoroughly.